* Stop #8 of my Burger Love adventure. Next up was a stop at Brother's Two restaurant in Summerside. The B2 "Beachcomber" consisted of a 6oz. 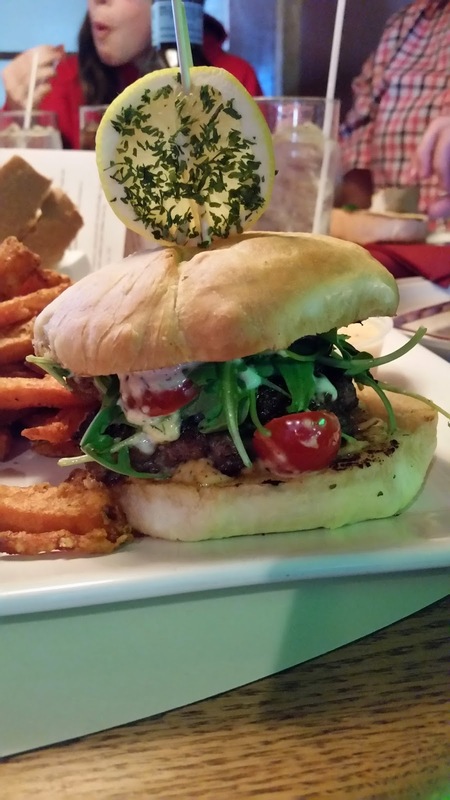 Island Beef patty with B2 Spices, breaded PEI clams dusted with cajun seasoning, homemade tartar sauce, homemade lemon aioli, fried brie cheese, caramelized onions, arugula, and grape tomatoes on a homemade B2 bun with garlic butter & sea salt, topped with fresh lemon. Although I normally don't eat much seafood I decided to give this one a try since we wanted to have all of the different burgers in Summerside. As I mentioned in my original Burger Love post, I'm a little fussy, tartar sauce isn't something I enjoy so I didn't have great expectations going in. My favourite part of the burger was surprisingly the clams, I just wish there would have been more than a couple. The breading was light but very tasty. I think I would have really enjoyed having an order of them on their own, which I might have to do next time. Unfortunately, for the rest, I found the tartar sauce a bit overwhelming, likely because I'm not a big fan, and seemed to take away from any flavour the burger might have had.